Despite ongoing price inflation and an increase in utilization, prescription drug trend dropped for a majority of CVS Health pharmacy benefit management (PBM) clients in the first half of 2016. In fact, by midyear, more than a third of PBM clients had negative trend. Just two years ago, more than half of all PBM clients had trend in the double digits. At the end of 2015, trend had declined to 5 percent. Aggressive management appears to continue to push trend down in 2016. In response to inflation, a major trend driver in 2014, many PBM clients adopted a more tightly managed formulary, helping to push generic dispensing up. Many also adopted our compound strategy, dramatically reducing spend on compounds. Since 2015, declining utilization of antivirals used to treat hepatitis C and a slower rate of price inflation helped lower specialty gross trend. 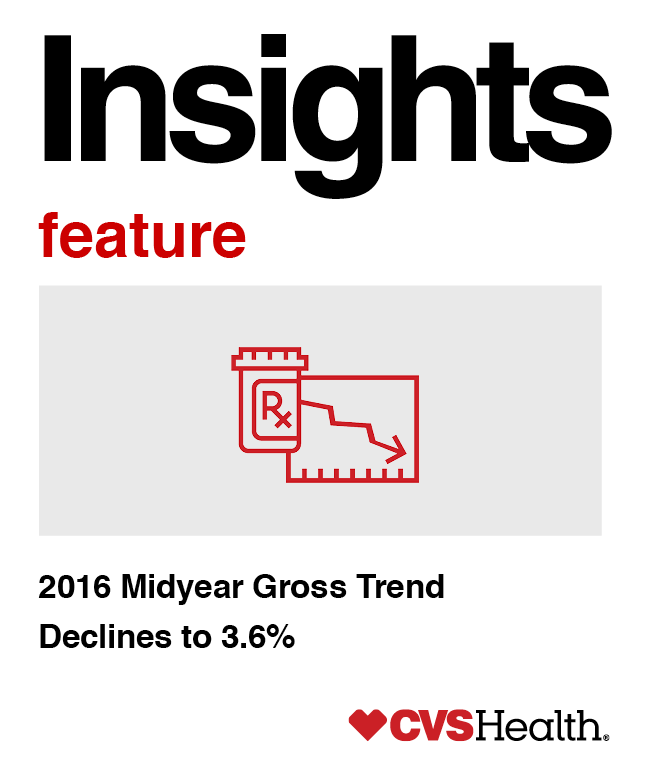 Midyear 2016 specialty trend was close to half of what it was in 2015. Brand price inflation continued to be the primary trend driver in the first half of 2016. Non-specialty brand average wholesale price (AWP) inflation (13.9 percent) outpaced AWP inflation for specialty brands (12.2 percent). As reported earlier in Insights Feature, intelligent purchasing and versatile cost management strategies, including formulary, helped to reduce the impact of manufacturer price increases. After several years of slow growth, utilization growth so far this year is more than double that in 2015 — up to 2.7 percent in 2016 through June compared to 1.3 percent in 2015. A number of factors influence utilization, including the time of year; utilization growth tends to slow in the second half of the year. Other influences include the economic climate, insurance status, changes in cost share and health awareness. Programs that support improved adherence, such as Pharmacy Advisor, can also impact utilization. However, research has repeatedly demonstrated that with optimal use of cost-effective medications such as generics, the cost impact of higher drug utilization may be offset by reductions in overall medical spend due to improved adherence. We expect a modest bump in generic dispensing rates (GDRs) from the mid-2016 launch of a generic for the cholesterol drug Crestor. GDR was up to 85.5 percent in the first half of the year. Our analysis indicates that the 1.5 percent increase in GDR translates roughly into a projected reduction in spend of 3.75 percent. Anti-inflammatory analgesics and antidiabetics topped the list of trend drivers. These two categories contributed 4.3 percent. Specialty drugs used to treat rheumatoid arthritis and other autoimmune conditions dominate spend in the anti-inflammatories. AWP inflation for the category as a whole was 18.4 percent in the first six months of 2016. A biosimilar for category leader Humira may offer eventual pricing relief, but patent litigation could delay the biosimilar launch for years, despite a positive recommendation from the advisory panel at the U.S. Food and Drug Administration earlier this summer. AWP inflation for antidiabetics was 13.6 percent. The category is also experiencing 6.17 percent growth in utilization in 2016. This category also faces pending competition as a biosimilar for Lantus moves closer to approval. In order to help PBM clients realize the maximum cost benefit, we pre-emptively removed Lantus from our Standard Formulary for 2017. It will be replaced by other more cost-effective products including Levemir from Novo Nordisk and Basaglar, the follow-on biologic product from Lilly. Management strategies blunted the impact of both of these categories for our clients. They also helped to reduce the impact of compounds, which had been a major driver of spend in recent years. Many PBM clients adopted our compound management strategy in 2015, which helped to result in a drastic drop in per-member-per-month (PMPM) costs – from just under $5.00 in Q2 2014 to less than $0.20 in Q2 2016. However, clients without optimal strategies are still experiencing high spend. Antivirals still rank among top classes by spend. However, as a contributor to trend they have far less influence than in previous years. Spending on hepatitis C therapies peaked in March 2015, with a PMPM cost of $5.96, as utilization of highly effective new antiviral treatments surged. As of June 2016, costs for the category had dropped to half that – $2.58 PMPM. The drop helped reduce both overall and specialty gross trend. Market events continue to have a profound effect on pharmaceutical spending. As our midyear numbers show, intelligent purchasing, ongoing market surveillance, and active management are critical in helping payors control spend and reduce prescription drug trend. Reducing prescription costs is only one part of our multi-pronged strategy aimed at improving health care and reducing costs overall. We have taken advantage of our multiple channels and developed programs that promote adherence and simplify complicated prescription regimens, making it easier for members to manage their chronic conditions. For example, direct outreach from our pharmacists has helped to halve the number of patients who are re-admitted to the hospital, improving their lives and lowering costs. Such readmission prevention is one of a number of quality measures we can support to assist our clients in improving their ratings. These measures help to lower overall costs, thereby also helping to lower the cost individual members have to spend for their share of health insurance costs, whether as premiums or copays. We are proud of the essential role we play in helping control health care costs, and we look forward to helping our clients lower spend and trend in 2017. Managed networks can help reduce costs as well as help improve clinical outcomes by supporting health and wellness initiatives. Prescription drug trend is the measure of growth in prescription spending per member per month. Trend calculations take into account the effects of drug price, drug utilization and the mix of branded versus generic drugs. Trend figures cited are for commercial cohort (health plans and employers). Gross trend is reported net of rebates. All of the savings and/or trend changes discussed in this Insights Executive Briefing will vary based on a variety of factors, including demographics, plan design and programs adopted by the client. Client-specific modeling available upon request.